White paper on crime 2004 Part4/Chapter2/Section2/2. Fig. 4-2-2-4 shows the number of juvenile cases received by family courts for non-traffic offenses and road traffic violations in the last10years. The number of juveniles received in2003increased for non-traffic cases,while it decreased in road traffic law violations cases.The total number decreased by10,684juveniles(down3.8%)to270,954. Fig. 4-2-2-5 shows the final disposals of juvenile cases by family courts in2003(excluding professional negligence,unsafe driving resulting in death or injury,road traffic violations and status offenses).Dismissal without hearing had the largest share(over70%),followed by dismissal after hearing(nearly10%),protective measures such as probation and commitment to juvenile training school accounted for16.1%(see Appendix4-9). Fig. 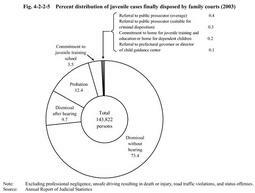 4-2-2-6 shows the final disposals of juvenile cases for homicide and robbery by family courts in2003. For homicide,commitment to juvenile training school and referral to public prosecutors accounted for more than80%.Similarly,in the case of robbery,probation and commitment to juvenile training school exceeded80%. On April1,2003,the Law for Partial Amendments to the Juvenile Law etc. (Law No.142of2000)took effect.Under the amended Law,any case where a juvenile aged16or older kills a victim through an intentional criminal act must be decided to be transferred to a public prosecutor unless a family court concludes after investigation that the case should be handled differently from criminal disposition.A total of238juveniles were subject to this principle during a three-year period from the enforcement of the said law until March31,2004(excluding nine juveniles who were transferred to public prosecutors and then transferred back from district courts to family courts under Article55of the Juvenile Law).Out of the238juveniles,it was decided to transfer137(57.6%)to public prosecutors.The percentage of transfer by type of offense was53.5%(23juveniles out of43)for homicide,53.4%(78juveniles out of146)for injury resulting in death,60.0%(15juveniles out of25)for robbery resulting in death,a nd95.5%(21juveniles out of22)for unsafe driving resulting in death.Since the average percentage of transfer to public prosecutors during a10-year period until the amendment to the law was24.8%for homicide,9.1%for injury resulting in death,and41.5%for robbery resulting in death,it has become higher after the amendment(Source:General Secretariat,Supreme Court). Fig. 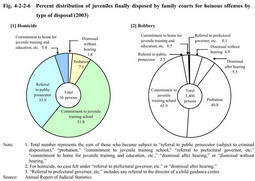 4-2-2-7 shows the disposal of status offenders by family courts in2003.In comparison with juvenile offenders(excluding those for professional negligence,unsafe driving resulting in death or injury,and road traffic violations),the percentages of both probation and commitment to juvenile training school etc.were higher in the case of status offenders.